So emphasising a humanist education rather than training builds reasoning, critical thinking and creativity. That’d be great, except that none of those skills are at all useful in the festering wound which is our society. Teaching children to learn and follow their interests only creates a fantasy of adult life, whereas training them for the reality of wage labour avoids any such delusions. What is the point of schooling? Is it to expand your intellectual capabilities and widen your range of thought, or just to train you in the techniques required for future employment? These objectives are not just competitive but actively contradictory and held in constant tension in our education systems. The top university in Australia recently announced a new scheme for assessing undergraduate applicants. The ANU’s new policy will substantially loosen the requirements for academic results and add a new requirement for extra-curricular activities. This acts to screen out those from working class backgrounds and ensure those from the upper class take their ordained place, regardless of talent. To further my earlier post on STEM oversupply, I took a look at historical graduate numbers and job openings (on a three year rolling average to smooth out fluctuations), using data from the ABS and the Department of Education & Training, accounting for not just retirement but also deaths and migration (though occupation data on skilled migrants isn’t available). In short – even under the old restricted entry system, graduates often outpaced opportunities but the combination of economic slowdown and increased access to education after the GFC has led to this gap widening to its present unsustainable level. 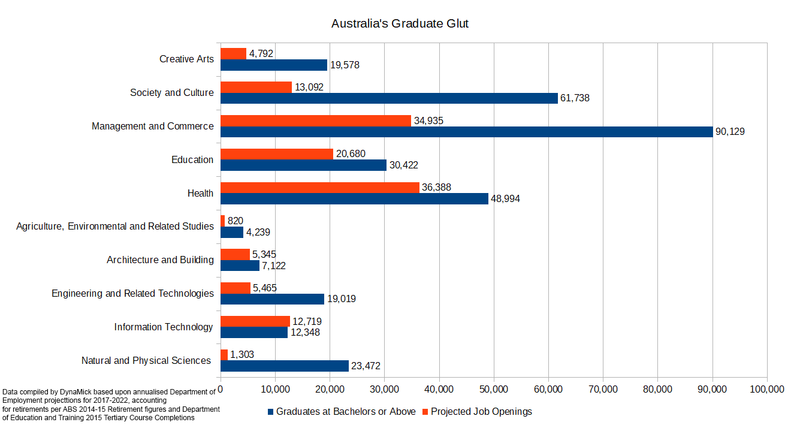 Deregulation of university places by the Gillard government has left a legacy of massive graduate oversupply. The chart above makes for stark reading, with many more graduates than jobs available for them in every field except IT, much like the situation in the US. The much vaunted STEM field, which Australia’s Chief Scientist declared should be “at the core of almost every agenda” is revealed to be a hollow wasteland, with 18 graduates for every job in the maths and sciences. The supposedly “always in demand” engineering sector provides a similar employment proposition to the much derided creative arts stream. Without jobs in their area of study, graduates in SEM will be forced outside it in order to find work, if indeed they can find skilled work at all given the depths of the oversupply. So how did we get here, and why is STEM still lionised as a cure-all to employability?